Aaargghhh! Forgen...begorgen...befriggengiggenaosidjfoasijdfoi!!! I hate this freaking game. Sega had this thing about porting their arcade titles, with good reason, they were good at making them. However, not every title they made was good. 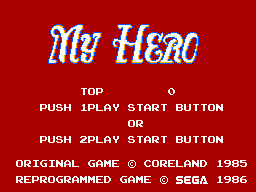 My Hero was originally in the arcade and had a number of flaws, including some really shawted collision detection that benefited the player. It still had a bit of charm to it, until they decided to go forward with their ingenious 'card' idea and put this on it. Said idea was quickly tossed into the mire. 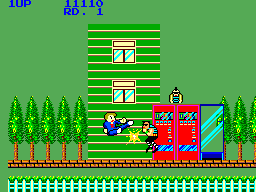 My Hero was a really, really old beat-em-up from back in the day that had this strange, 50s feel to it. Basically, you feel like you're controlling a Soc and taking on Greasers (see that, my childhood English class forced me to read The Outsiders for a reason other than wasting a day watching the movie). Anyway, so Mohikan, the punk guy at the start of the game, takes your girlfriend and you have to take out a bunch of enemies before you face him, he takes her again and you go through another level. Really, that's not bad for a card game considering the memory restrictions, but My Hero ends up being one of the most terrible things you'll ever play for a few reasons. First off, the difficulty is set to god level. My Hero takes an incredible amount of memorization in order to progress. Second, enemies come at you in terrifying waves. You'll lose most of your lives the first two seconds you play it until you get used to the odd collision detection and controls. That's the third problem, the controls are responsive but only one attack, the jump kick, lets you get anywhere because of the collision problem. This is complicated further by the need to continuously jump forward and back to get enemies coming at you from all directions, making the game look very strange as you play it. The final problem is that, because of the necessity in memorizing nearly everything's location, it's nearly impossible to actually play this game with skill alone, adjusting as the difficulty increases. You simply have to know where everything is all of the time to get anywhere, and even then you basically go through what are more difficult versions of the same first level; they just moved some shite around. 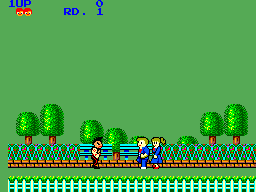 My Hero has some of the most hideous graphics on the Master System. Seriously, what were they thinking with this one? They did a decent job with most of the enemies and the environment, but what in the hell possessed them to program the background entirely green? I imagine there must have been something in the memory issue that made them do this, but it looks so terrible it's beyond words. This has to be the worst video game background ever programmed. Puke green? What? I actually kind of dug the music in My Hero. It has this odd, almost silent-filmesque sound to it that fits the feel and idea of the game pretty well. I almost imagined an organ player in front or something, just like a really old theater. The sound effects seemed pretty fitting too, so I have to say I didn't have any problems in this category. The controls, as mentioned, are quite responsive. The problem is that in spite of this you can only really use one move, and the necessity in constantly flipping around forwards and backwards really puts a strain on your hands after awhile. Ha, haha ahahahaaaa.....aaaaaha hahhaa! Replay? Yeah, no, I'd never play this again. I could scarcely make it to mid-way in the second level after a number of attempts, and considering that there's probably no ending and not much more variety later on, I really doubt I'll have the courage to give it another go. I'm not even sure why I own it. If I had the cartridge version (why did they release one anyway if it fit on a card) I probably would have thrown it out. I guess that's the reason, it takes up less space. Then again, is that a reason? Perhaps no space would be better. Just avoid My Hero unless you absolutely must have it for your collection or want the Portugese edition with the cooler box art. Actually, no, you'll probably hate it more in that case. At least the regular artwork gives you a clue of what the game's about, the Portugese version makes you think it's awesome until you feast your eyes upon it. Anyway stay far, far away from My Hero. Let the greaser win for a change!